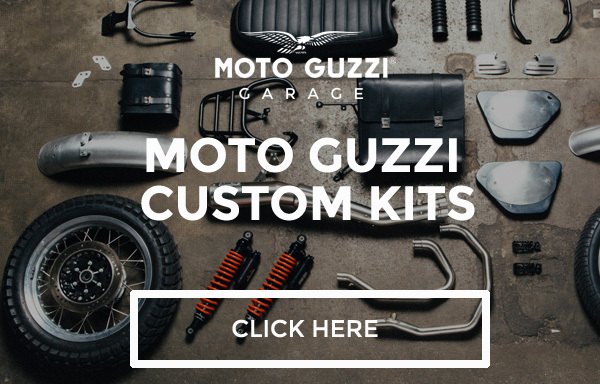 Versatility is a key factor for the ongoing success of custom Moto Guzzis. This is especially true for bikes like the Nevada, which is perfect for city riding but easily transforms into a long-distance tourer with some modifications like factory luggage. The new V9 Roamer continues on this trend, bringing touring rights to the base V9 city dweller. The V9 Roamer is the Italian factory custom bike dedicated to the long-distance traveler. The Piaggio Group Style Centre developed the Roamer with input from the PADC (Piaggio Advanced Design Center) in Pasadena, Calif., the birthplace of motorcycle trends that spread to the all corners of the earth. The V9 Roamer is a superb combination of classic and essential style with high-level finishing touches that display the unique architecture of the new 850 twin cylinder. The details speak for themselves, including the new wheel rims (19" front and 16" rear) painted in matte black and treated with a diamond-cut finish, as well as the new multi-function digital dashboard with a single circular gauge. Comfort is provided through a relaxed riding position and padded seat, which is decorated with the Moto Guzzi logo stitched with grey thread. The seat, just 30.5 inches from the ground, is complemented by a raised chrome handlebar and the correct placement of the forged aluminum foot pegs for the ideal rider triangle. The V9 Roamer also continues Moto Guzzi's successful tradition of keeping the overall weight to a minimum. If the V7 III and California 1400 are already among the lightest bikes in their respective groups, the V9 Roamer’s curb weight of 439 lbs. is a true lightweight record in its class. This reduced weight, combined with the V9 Roamer's superb riding quality and low-end torque offered by the new 850 twin, creates pleasurable ride. The V9 Roamer is a true mid-sized motorcycle, factory designed for those who love Moto Guzzi culture, but want to easily travel the distance. The V9 Roamer arrives with a 90° transverse air- and oil-cooled 850cc v-twin engine that is tweaked for the all-around performance. Starting from the bottom of the engine, the new aluminum crankcase, which was stiffened at the key points, is complimented by a new oil pan and an inertia-calibrated crankshaft for easy revving and optimal engine braking. For better performance and fuel consumption, the lubrication and ventilation systems were overhauled. Other lower-end engine improvements include new piston cooling oil jets with check valve and flow management, and a redesigned alternator cover with a blow-by gas output. The upper part of the 850cc twin features new aluminum heads, pistons and cylinders, along with a one-piece Marelli electronic injection system. When combined with the three-way catalytic converter, the double oxygen sensor and the total redesign of the engine, the new auxiliary air system brings the twin 850 Moto Guzzi into compliance with EU4 standards. The V9 Roamer’s engine produces 55 horsepower @ 6250 rpm, and 45.7 ft/lbs of torque @ 3000 rpm. The engine utilizes a single dry-plate clutch and six-speed transmission that delivers the power to a double-jointed drive shaft offset by a new bevel gear, which provides solid and reliable management of the powerful torque supplied by the twin engine. The cast aluminum swingarm has been designed and sized to support engine performance, as well as to accommodate the new 150mm tire. Carlo Guzzi was one of the first motorcyclists to grasp the importance of a chassis that responds perfectly to the imperfections in the road surface. This led to the design of the Norge GT of 1928--the first motorcycle with a "spring frame" that was equipped with front and rear suspension, bringing enormous advantages in terms of safety and riding pleasure. This tradition continued from that day on. It’s worth noting that the 1970 California, under the name V7 Police, was bought by the Los Angeles Police Department after a series of tough tests. Following in the footsteps of the V7II and the big 1400s, the V9 Roamer is the latest bike from Moto Guzzi that continues the tradition of safety and riding pleasure. The new steel twin tube cradle frame creates optimal weight distribution on the front and rear of the engine, which provides the rideability and dynamic balance typical of all motorcycles built at Mandello del Lario. The designers paid special attention to the front, which has gussets in the steering head and new slope and trail abilities, making for a superb ride with the perfect combination of handling and stability, as well as precision and feeling. In addition, the entire chassis benefited from care and finishing of the details, including welding and painting. The suspension is also new, using traditional long-travel (130 mm) inverted forks and a new pair of spring preload adjustable shock absorbers that connect to the frame. The design provides a gradual and controlled response at all times. The V9 Roamer’s braking system utilizes nothing but the best: Brembo four-piston calipers squeezing a 320mm steel disc up front, and a two-piston caliper squeezing a 260mm caliper out back. Like all modern Moto Guzzis, the V9 Roamer is equipped with advanced electronic systems for additional safety. The Roamer arrives with a standard advanced two-channel ABS and MGCT (Moto Guzzi Traction Control) that’s adjustable in two levels of operation and can be turned off. Other standard features include an immobilizer and USB charging port located under the steering head. The new electronic instrumentation, with a single circular dial, is also consistent with the style of the modern V9s. The speedometer has an analog dial, and all other information is displayed digitally: odometer, partial trip and daily trip (with automatic reset after eight hours after shutdown), trip time, instantaneous and average fuel consumption, clock, outside temperature, average speed, MGCT level, in addition to the gear position and shift indicator (idle and maximum shift rpm can be adjusted by the user). The extensive catalog of accessories for the V9 Roamer includes the MG-MP, the Moto Guzzi multimedia platform that connects a smartphone to the vehicle to provide an exceptional quantity of information useful for the journey. An optional multimedia platform, the MG-MP, allows you to connect the V9 Roamer to your iOS or Android smartphone. The app is available for free download from the App Store and Google Play, making your smartphone an on-board multifunctional computer and the link between the motorcycle and the Internet. The wireless connection allows you to simultaneously view a set of vehicle information on a smartphone screen so you can constantly have an eye on the travel parameters: speedometer, rev counter, instant power, instant torque, instant and average fuel consumption, average speed and battery voltage, longitudinal acceleration and extended trip computer. Five of these parameters are available for view at any time. The “Eco Ride” feature helps to limit fuel consumption and to maintain eco-compatible riding conduct, providing a brief assessment of the results obtained during the trip. You can record trip data and review them on your computer or directly on your smartphone, analyzing the distance covered together with the V9 Roamer’s operating parameters. The system also allows you to easily locate your vehicle when you park in a strange place, automatically saving the position where it was switched off. MG-MP includes the “Grip Warning” function that replicates the indications on traction control operation for maximum visibility and provides information in real time on your riding performance with relation to the road surface conditions. A dedicated indicator light warns in the event of excessive use of available grip. Thanks to the synergistic use of gyroscopes and the information coming from the vehicle, the smartphone becomes a sophisticated instrument to measure the lean angle in turns thanks to algorithms developed specifically for the new Moto Guzzi. The limit thresholds can be set both for lean angle as well as vehicle and engine speed. When these limits are exceeded the relative indicator lights will come on or the virtual dashboard will flash. The new V9 Roamer a can be widely customized from the vast range of genuine Moto Guzzi accessories. These OEM parts undergo strict testing cycles, like any other original motorcycle component, in order to ensure quality and reliability. They are perfectly interchangeable with standard parts and allow for easy restoration of the motorcycle to its original state. All parts are completely street legal, allowing you to customize your bike without voiding the warranty. Moto Guzzi has designed an authority-approved sportier exhaust system for the V9 Roamer with the total black look and deep sound. There are many details in aluminum billet that add more charm and exclusivity, and there are also practical accessories, such as the urban style fairing and luggage sets, which blend very well with the design of the V9 Roamer. The Moto Guzzi V9 Roamer is available in two different color variants, both with a glossy finish: Giallo Solare with black accents, and Bianco Classico with red accents. (*) Prices listed are the Manufacturer’s Suggested Retail Prices. MSRP excludes PDI (Pre Delivery Inspection), Taxes, Shipping Costs, Title, and Licensing Fees. All prices and specifications are subject to change. Dealer prices may vary.